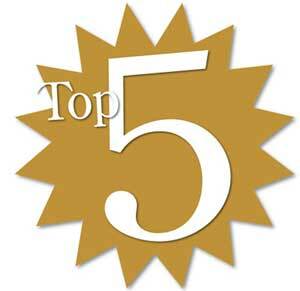 Ask the people who search out BYOB’s in the Delaware Valley to name their three favorite and there is an excellent chance Gilmores, in West Chester, PA will me mentioned. Prior to last night I had never been there. 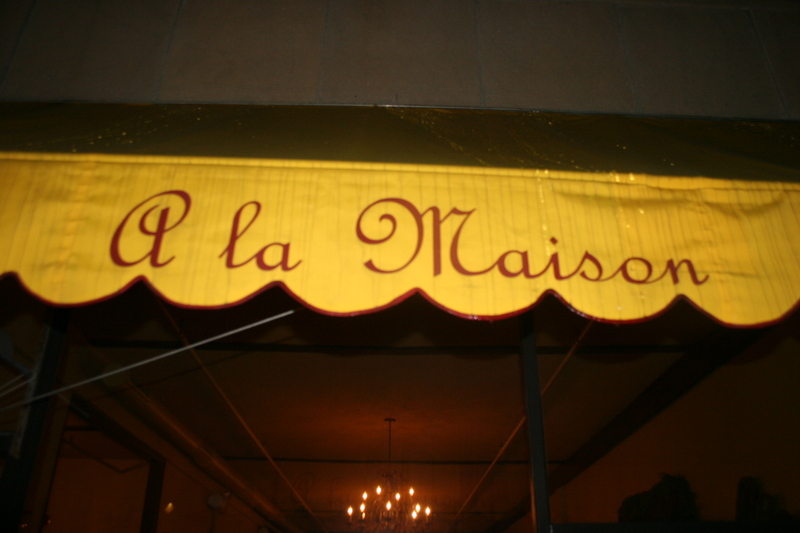 My wife, Kathy and I joined our friends Gerry and JoAnn B. for an 8:30 reservation at this highly regarded French bistro on Gay Street in West Chester. 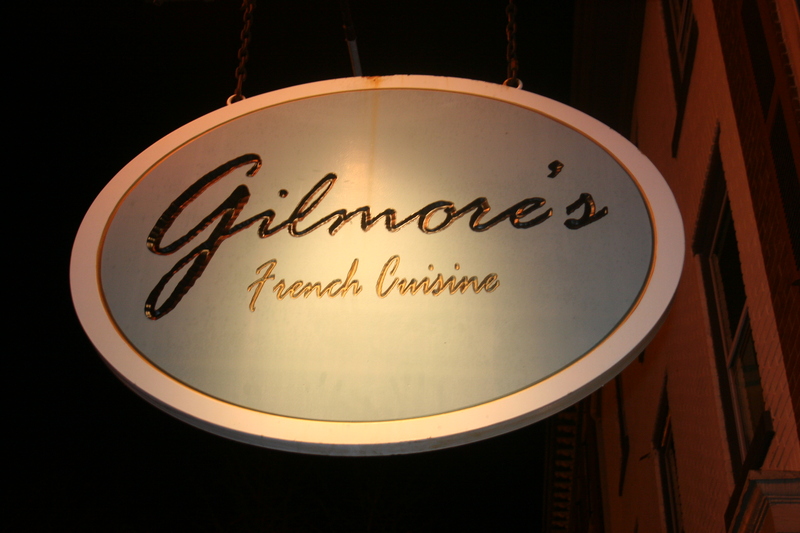 Gilmores has two seatings each evening at 6:00P.M. and 8:30P.M. and when we arrived the early diners were leaving and we joined about 20 other hungry folks in a very crowded entryway where the walls were decorated with a mix of Philadelphia Magazine Best of Philly Articles and some interesting modern art. After 10 minutes or so the tables were bussed and re-set and we gained admittance to the intimate dining room. Gilmores seats about 40, and although the room is small, it doesn’t feel crowded. Our waitress, Stephanie, was knowledgeable and enthusiastic, and as she opened our wine she told us about the evening specials. Earlier in the afternoon, we had enjoyed a bottle of the 2006 Mollydooker Velvet Glove. The wines for our meal were only slightly less formidable. 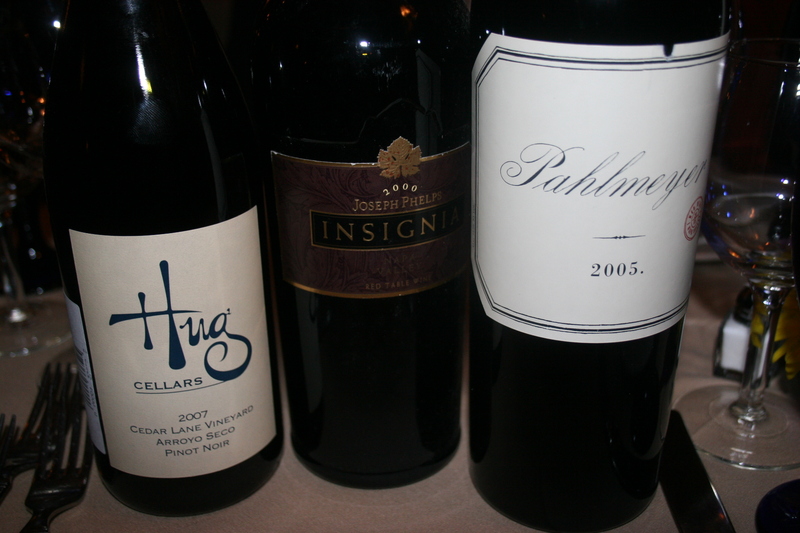 Gerry had brought two excellent choices, the 2000 Phelps Insignia and the 2005 Pahlmeyer Red Blend. The Insignia seemed to me to be underrated by the experts (94 WS, 91 Parker). It displayed class and strength and loads of smooth plum and blackberry flavors that could stand up to any steak or lamb dish. I’d compare this to any other Cabernet blend in the $100 price range. The Pahlmeyer, too was singing beautifully and certainly deserved it’s 96 Parker rating. I brought with me the 2007 Hug Cellars, Cedar Lane Vineyard, Arroyo Seco, Pinot Noir. 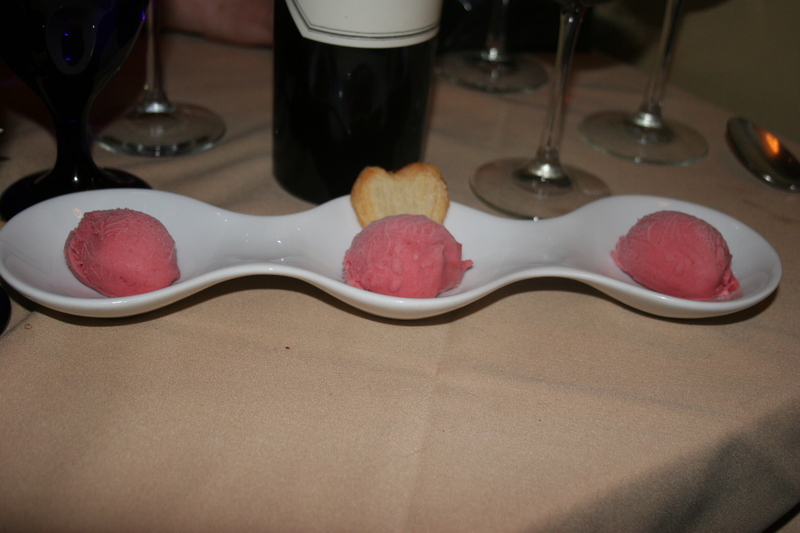 The bright black cherry and raspberry fruit with hints of cedar and spices was perfect with my scallop appetizer. Then there was the food. 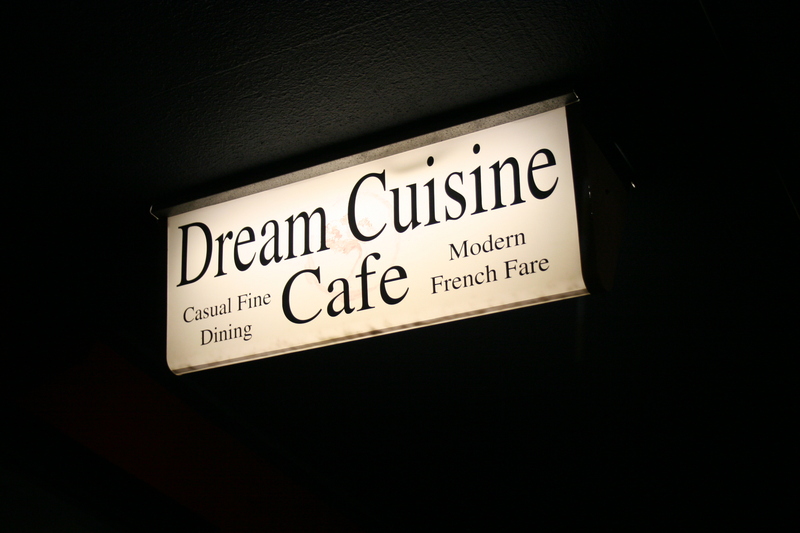 So many taste-tempting items on the menu that it was hard to make a single selection. 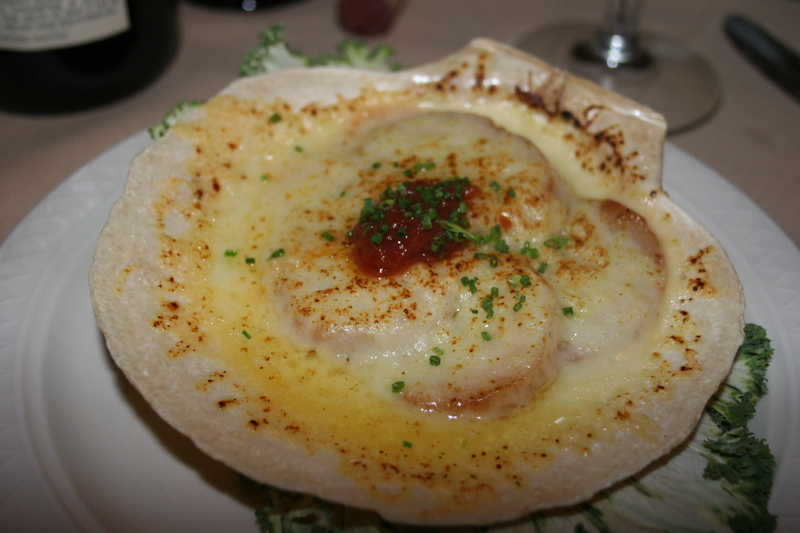 I finally settled on the Coquilles St. Jacques a la Proven, scallops, gratin with wine, garlic and herbs. This dish was simply heaven on a plate. The scallops were sliced thin, cooked perfectly and topped with a wonderful cheese layer and the sauce was just fantastic. 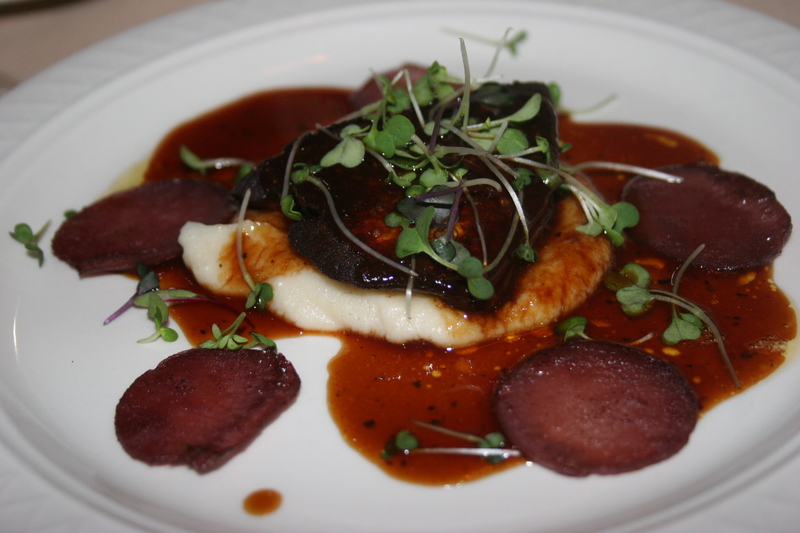 Kathy ordered the same thing while Gerry, predictable as ever when he spots fois gras on the menu, ordered the Fois Gras Sautu Navers (from humanely raised ducks), seared fois gras with port braised turnip and celeri mousse. On its arrival he turned silent for the next few minutes and slowly devoured the liver of those poor ducks who gave their life and liver so that he could enjoy this culinary treat. 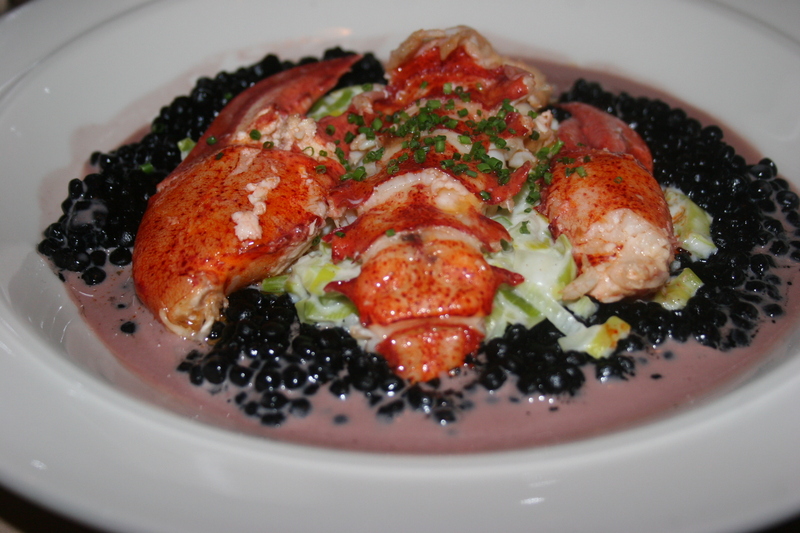 JoAnn was a little adventurous in her selection as she chose the Cappaccino de Homard. 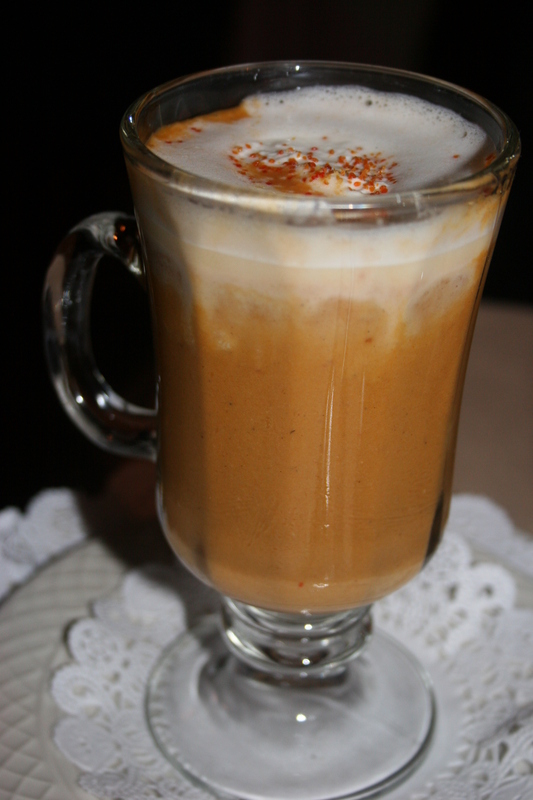 Lobster Soup flavored with Scotch and topped with Anisette foam. It looked like a cup of light-colored coffee and tasted like liquid lobster. She was very pleased with her appetizer. 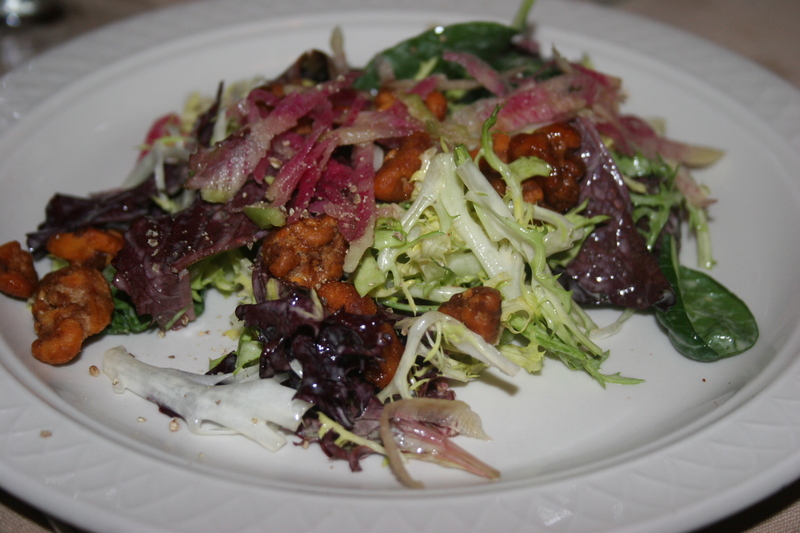 Each of our entries came with a house salad which consisted of fresh field greens with walnuts in a very tasty dressing that I could not identify. 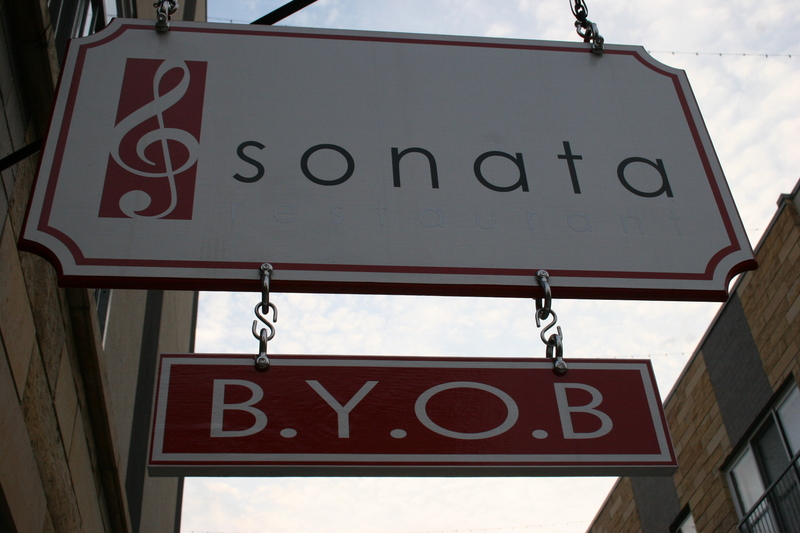 It was really very nice and helped lead into our entrees. This was the hard part. Some of the evening specials sounded terrific and Gerry was quick to jump on a particular one when Stephanie informed him there were only 5 of these left as the 6:30 crowd had made a run on them. That Item was described as a one and a quarter pound Maine Lobster, removed from the shell and poached in lobster butter served over an ink squid dyed cous cous in a lobster butter sauce. It looked and tasted wonderful and had everyone else not been totally ecstatic over their own choices we might all have opted for the lobster. I ordered from the menu and had “The Butcher’s Tenderlon”, pan-seared hangar steak with Bernaise Sauce and truffled french fries. 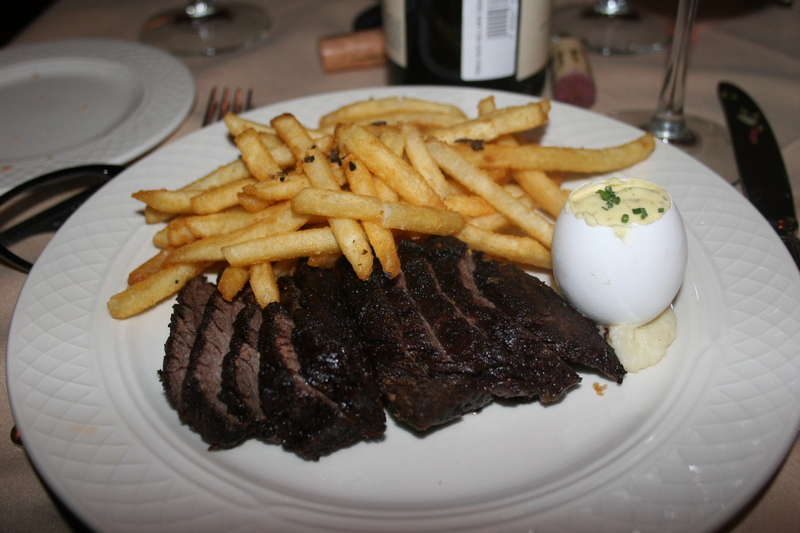 The steak was done perfectly, tender, flavorful, the Bernaise Sauce served on the side in an egg cup and the french fries were amazing. I honestly would not have thought you could do french fries in such a way that would make them so uniquely different from so many others. The texture and taste were amazing. Kathy also ordered one of the evening specials. 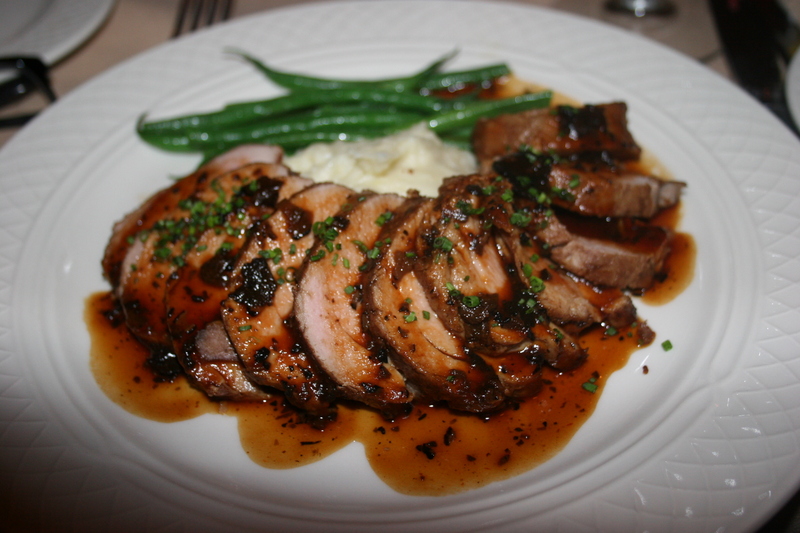 She chose the Roast Pork in a slivered Truffle Sauce served with fresh green beans and a potato puree. As with all of the entrees, this one was perfectly prepared, the pork bursting with rich flavor and the sauce providing a perfect basting for the meat. This was JoAnn’s third visit to Gilmores and she had the same entree on her first two visits. She decided to make it three in a row and ordered what she felt was the best item on the entire menu. 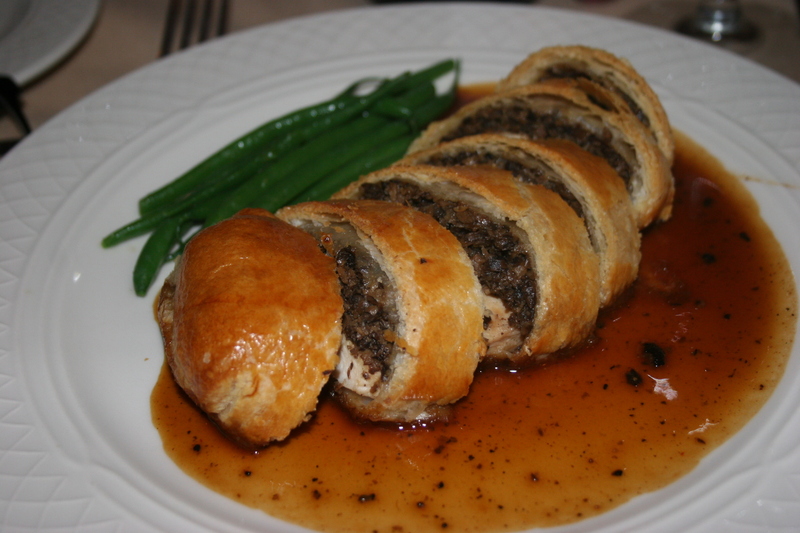 Poulet Wellington, breast of chicken with truffled mushroom duxelle (think of a mushroom pate) wrapped in puff pastry and served with a Perigourdine sauce. She gave me a taste of it and although I am an avowed mushroom abstainer, I think I could have eaten and thoroughly enjoyed this dish. 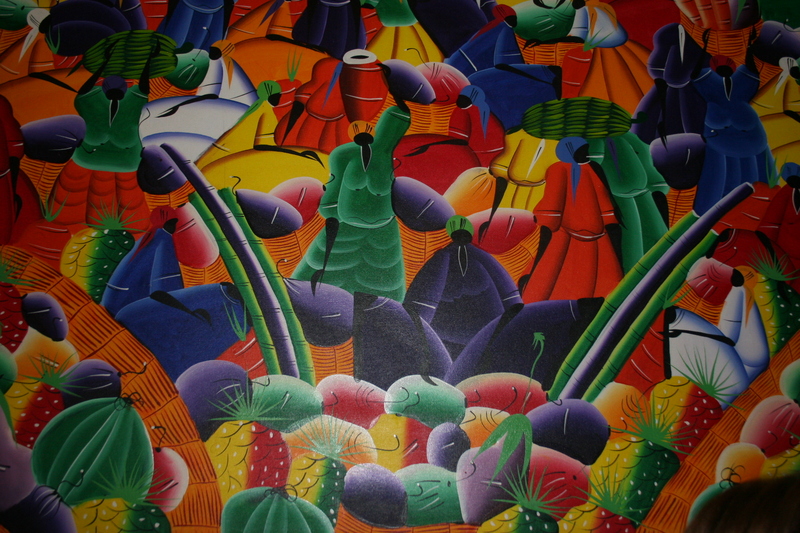 Maybe they just have to not look like mushrooms! The wine, the food, the company, it was a great setting and a great meal and it deserved appropriate desserts to top off the evening. Jerry and I chose something cold and creamy. 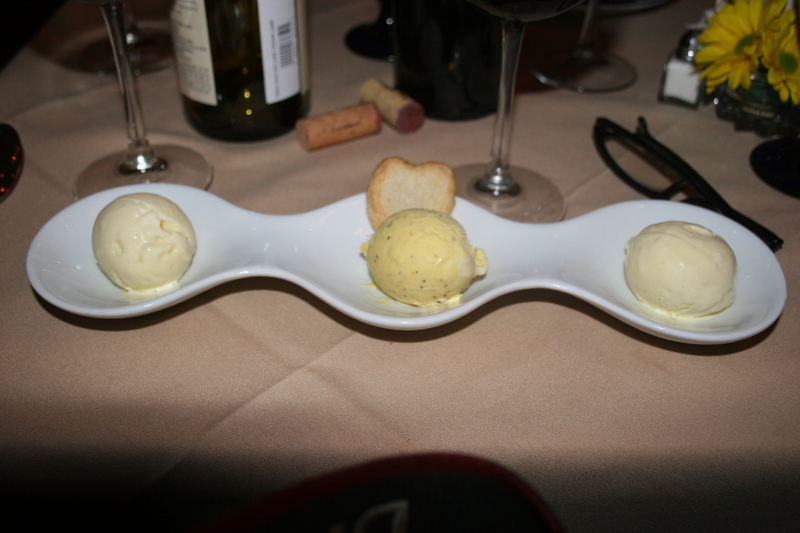 He chose the Raspberry Sorbet while I selected two different ice creams, the Tahitian Vanilla and the Orange Davilla. As far as I was concerned this was the perfect ending to a wonderful meal. 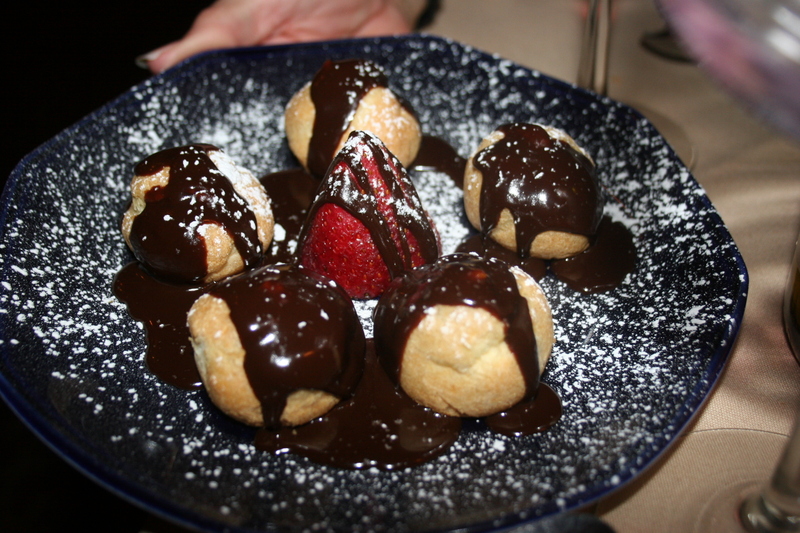 Kathy and Joann split the 2000 calorie Pofiteroles bathed in gooey chocolate, dusted with powdered sugar and surrounding a lone strawberry. There were five Profiteroles and I think the one who only got two was therefore entitled to the strawberry. Somehow, they worked out the division peacefully. On the way out I looked again at the Best of Philly framed articles on the wall and now I understood why they won so many of them. Chef/Owner Peter Gilmore knows how to create great food in a great setting.